So we had a Saturday morning with nothing planned. 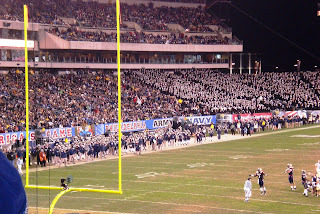 We found out that the Army-Navy rivalry football game was that afternoon in Philadelphia, so we went online to look for tickets. We found some, paid $1 each over face (not bad for a sold-out big-name game like that! ), and printed them out as we hurriedly threw on coats and grabbed hats & gloves. Parking was easy, it was a nice walk to the stadium, and we were able to see the paratroopers dropping in as we headed toward the gate. The gates actually opened four hours before the game, and there were all sorts of festivities that go along with the tradition of these two teams playing one another. 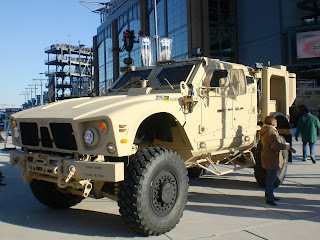 They have a bunch of military vehicles you could look at. We made it to our seats just as the Secretary of Defense was doing the coin toss. 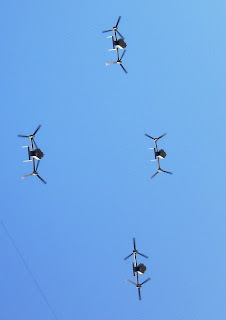 We saw the flyover, neat aircraft! The game itself wasn't that good. 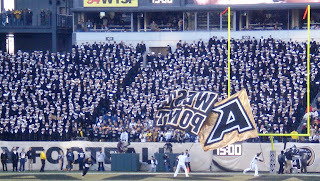 The stands were filled and there were some excited fans, but overall they were pretty quiet, which I wasn't expecting. The teams did a lot of running, some bad passes, and two missed kicks. 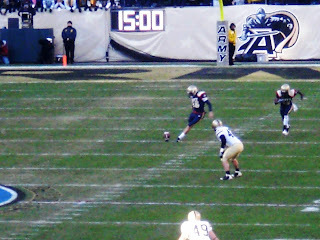 I got a good shot of kickoff and one kick, so here's those. Low score, so we didn't get to see a lot of celebration, but I did get one of each team waving its flags. It was neat to see the "student" sections since all the kids dressed in uniform. 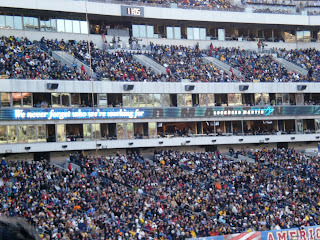 Lockheed is one of the sponsors for the game, so there were a lot of advertisements. 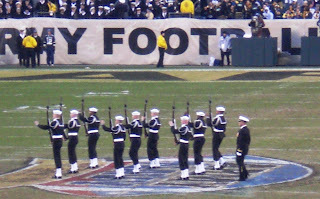 I was disappointed in the halftime show, since it was a small drum & bugle corps and a ceremonial color guard show. 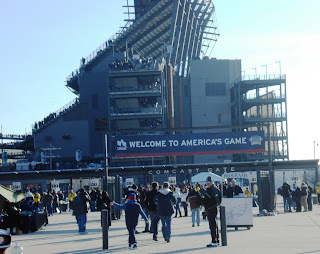 It was quite cold, 38 degrees at kickoff, so by sundown it was probably freezing. Thank goodness for my gloves! 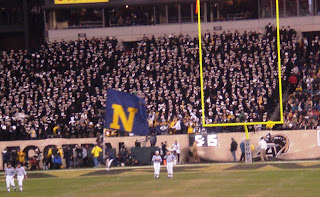 Oh, and while we technically sat in the "Navy" section, we were definitely just rooting for the offense the entire time, haha.